God needs to make room for one more violin in her orchestra – Sue’s on her way up, with “violin” on her license plate. After beating breast cancer, Sue Northup, 72, couldn’t fend off brain cancer, and died in Helena on Monday, Aug. 27. 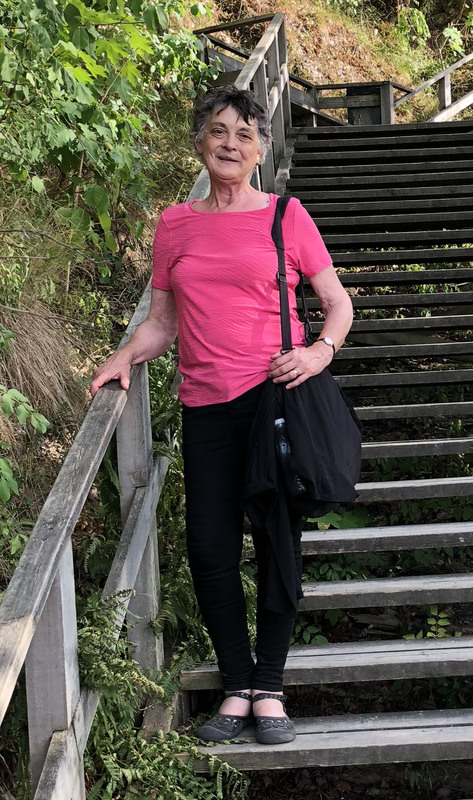 She passed after completing the “trip of a lifetime,” an anniversary tour of Scandinavia – home of her Danielson ancestors – in celebration of Sue and Brent’s 50 years together. Sue’s passions included teaching violin, playing violin, tending her garden, knitting, cooking and yoga. She was a devoted mother, a loving partner and a selfless friend. Her violin students were part of the family, walking in without knocking and doing homework in the kitchen while awaiting their turn. Long after they left, she’d sit in her favorite blue wingback chair typing personal lesson notes – “work on your bow hand; beautiful job on Bach” – that were emailed to every student, every week. Sue loved her daughter and husband with all her heart. She was a humble servant who quietly donated countless hours to her church, St. Paul’s Methodist. Hers was usually the first hand in the air when volunteers were needed to cook or clean or just help out. A large flock of grateful friends and students came to say thank you and goodbye at St. Pete’s in recent weeks. We thank you all for your presence, your cards, your drawings, your food, your flowers – and your concerts which included violins, voices, cellos, guitars and an accordion! Sue loved her students and friends deeply. Know that. Sue Jean Danielson was born on March 16, 1946, in Bremerton, Washington, the daughter of Rowena and John Danielson. She was raised in Mt. Vernon, Washington and graduated from Whitman College where she met Brent Northup on a blind dinner date that Brent hoped “wouldn’t get complicated.” It got complicated. Brent and Sue were married in Sue’s family living room in Mt. Vernon, Washington, on Dec. 28, 1967, during Christmas vacation of their senior year in college. Sue and Brent welcomed Katherine into their family in June 1987. Sue’s love for her daughter Kat, who was born on our 19th anniversary, was deep and pure. If Kat was joyful, Mom was joyful. No mom loved a daughter more. “God has called one of his angels home,” said Kat. Sue is survived by her husband Brent and daughter Katherine; sister Sally Mank and her husband Andy; sister-in-law Wendy Barone, and her husband Gino Barone; and her special cousin Jan Eyestone and her husband Bill; as well as many other cousins and her special friend, Beth. A Quaker tribute to Sue will be held at Touchmark, with a chance for friends to offer words about their memories of Sue amidst a silent worship service in honor of her life. The Quaker service, a silent hour with time for sharing memories of Sue, will be held at Touchmark on Sunday, Sept. 9 at 10:30 a.m. In lieu of flowers the family asks that friends consider donating to a fund dedicated to supporting young musicians as they discover the double-stops of Mozart or the fanciful melodies of fiddle tunes. Donations to the Sue Northup Memorial Fund, called “Sue’s Young Musicians,” can be made at any First Interstate Bank. This non-profit in Sue’s memory will offer support for lessons or instruments in hope kids will learn to love music as much as Sue did. Let’s let Sue take us home. Sue reflected on her journey after the discovery of the metastatic brain cancer this spring. It’s not filled with fear, but with gratitude, her life signature. Please visit below to offer the family a condolence or to share a memory of Sue. What a gracious musical ambassador of God’s love and mercy towards everyone who came in contact with Sue. Words cannot express how heavy my heart is today. Sue gave her time and energy to teaching my daughters’ violin. Even when times became tough for me, she continued to teach and inspire them with a heart of gold. Never, in the 15 years that I have known her, did I ever hear anything negative from her…always inspiring and positive! Sue truly was an angel of mercy. We will miss you so, so much! Sue taught two of my girls how to play the violin and she did so with love. Always encouraging, never, ever a negative word. Sue was the embodiment of compassion and kindness. Helena has lost a gem of a lady and I grieve her passing. My condolences to her family, friends, and the many children who were her students. Rest In Peace Sue. I’ll miss her so much. Rest in peace, sweet Sue. Sue has been a beautiful soul and a bright light. A talented violinist and a fine singer. I will miss her but her music and gentle spirit linger. Prayers and blessings for friends and family. Through my years as a Talking Saint, Sue was so very gracious and welcoming into your home. She always showed kindness to the students throughout the years. May her light guide you through the loss. I played with Sue in the Helena Symphony for 10 years ..she was my stand partner for most of that time I was part of it. She was so talented, patient and very kind. She helped me become a better player at something I loved and desired to be part of. I bet her students just adored her..I know I did. She also played violin for my grandmother’s funeral service at Saint Paul’s..and it was like she was an angel sent from heaven to sooth our souls for when they needed comfort…Sue was a blessing in so many lives..she is so going to be missed ..but never ever forgotten ! I met Sue through the Walk To Emmaus Community. I will remember her as a king, loving, extraordinary woman with a great sense of humor! She was always so upbeat and cared about life and those around her. My prayers to her family. This is a beautiful obituary to celebrate a beautiful life! I’ll miss you, Sue!! I had the immense privilege to study the violin under Sue. I am deeply thankful to have been her student and to have known Sue. My thoughts go out to her family. Sue was a middle C in the cacophony of this world. I will miss you Sue. Seeing Sue at work in the church always brightened my day. She will be missed by all. Sue has always been a very welcoming and positive person in the St. Paul’s community. I am very sorry to know of this. I always enjoyed her. She will leave a big gap. She made a difference for so many…..
Sue cane many times to my elementary music room with an array of string instruments, to introduce the students to them. My favorite story was how she got her violin. So kind and gentle with the students, and always a smile for a friend. So very sorry for your loss. Sue was such a wonderful woman. When we crashed Brent’s place we were always welcomed with a smile. I’ll always have fond memories of her. You are all in my thoughts. Hugs. God bless you and her family! She was blessed to have many friends and family, especially with her in the hospital. I will miss her greatly! Sue and I played in the Helena Symphony since I moved to town in 1996. Before that I came up from Bozeman is a contract player. Sue and I did the dance of playing in different positions in the symphony. But the most cherished was when she and I were stand partners in the principal violin 2 Section. She and I played many, many wonderful and delightful pieces of music. She was the best librarian! I cherished her friendship. She was always there for her family, for her students, and for her church family. I will miss her, along with everyone else. Her music will live on… In her family’s as well as in all of her students that she touched with the gift of music! What a gift she gave! Sixteen years ago I engaged Sue and her quartet to play during and following my daughter’s wedding at Salmon Lake Lodge. What wonderful memories that day still holds for us. It was an afternoon filled with love and Sue’s beautiful music, most of which she suggested and then played with such beauty and grace. On her walks past my home on South Ridge Drive she would always bless me with a beautiful smile and a wave. I knew she had a special soul….how else could she interpret with such love some of the most extraordinary compositions of our world. My condolences to Brent and Katherine and their extended family and all Sue’s friends in hope that your many special memories will bring sustenance and peace. and this life. Kat and Brent, I am so sorry. I will miss her too. Sue has been a fine mentor to me. My first encounter was sharing violin in the Helena Orchestra, as I see several above also occupied first chair in the second violin section. I also took lessons with her. We met together several times at Quaker gatherings. Brent and Kat, I am grateful for her elegant life, and all the ways you too enrich the community of Helena. Sue was a wonderful violin teacher for our daughter from the time she was a little girl. She taught a love of music as well as the skills to excel at violin. We are so sorry for the family’s loss. Sue was such a blessing to the musical community in Helena and to St. Paul’s Methodist Church. Her passing leaves a huge gap to fill. She was such an efficient organizer in her capacity as orchestra librarian and I always knew my parts would be waiting in her mailbox at the house with the red door whenever promised. My wife Cathy always knew when it was her turn to bring cookies to the fellowship hall and Sue was usually there to put them on plates for the folks between services. I always enjoyed making music with Sue and was very sad when she retired from the Helena Symphony. Sue was there for Cathy and I with encouragement and advice when we adopted our daughter Claire. We will miss her greatly. What a huge loss to the Helena music community! I first met Sue when she was the librarian of the Symphony. She faithfully had my part in the milk jug on the porch. Later I played with a small group of older beginning/intermediate string players. I looked forward so much to playing with her and the group. She gave so generously of her time and talents. She was a most kind and gentle soul. Blessings to you, her family as I keep you in my prayers. Thanks to Sue for enriching our lives and community for so many years. We’re also grateful for the passion she instilled in our son, Christopher, for the violin and other strings. We will miss her and owe her much. It is hard to say goodbye to Sue. Harder, because I am on a long trip out of state and cannot attend her funeral. I can only imagine the deep sense of loss her family is feeling, and I send my fondest wishes for peace and the healing power of warm memories to her family. I don’t remember when I met Sue, somewhere at St. Paul’s where we shared ideas about how to be in spiritual community. I always jokingly threatened to take violin lessons from her when I retired, and in 2017 she called my bluff. I began with clumsy bow strokes, my old fingers rigid and tight on the fingerboard, but she showed me with patience and kindness how to listen for the right tones and taught my hands to embrace the yoga of violin. I don’t know whether I will ever find another teacher/friend/soul like Sue. I will think of her whenever I play or hear Ashokan Farewell, the piece I was practicing in my last lesson. Itty bitty kids, itty bitty kids, itty bitty fiddles. We know itty bitty fiddles will play! I hope Sue’s Young Musicians fund is a huge success. I only wish we had many more years with Sue to help spread her love of music to the next generation of kids and give them all the itty bitty fiddles they need. We only met Sue once, but clearly her kind and thoughtful presence made the world a better place. Our condolences to her family and friends. I have known Sue since my Dad was minister at St. Paul’s church. I’ve organized music with her, laughed and rolled eyes with her, sat with her in the Cancer Center waiting room (back when she was accompanying a friend there, knitting patiently), worshipped beside her, and watched her enliven the musical souls of hundreds of young singers and string players. Some of us will be saying goodbye to Sue forever. Sue gave so much to so many. I was just one of those who loved her and will miss her. I cherish the delphiniums blooming in my window boxes today as I remember Sue. She will live on in so many ways. Brent and Kat, I can’t tell how sorry I am to hear of Sue’s passing. My heart and prayers go out to you, both. Sue played such a pivotal role in my life. When Sue first moved to Helena twenty-five years ago (? ), we became friends. As an adult musical novice, she gave me encouragement and confidence, enough so that playing the violin and viola has been my life’s focus. I loved playing in the Helena Symphony with her, but the best was playing duets. When I moved away, we each kept out Mozart duet parts so we could play together some day; I still hope we will.She and I had so much fun learning the Suzuki Method, and her positive teaching gave my daughter Sophie her wonderful start on the violin. I, too, loved teaching Kat! she was so adorable and sweet, a great first student. I wish so much I could be playing in the farewell concert tonight; I will be there in spirit.